Diverse Eating Occasions: Consumers focus less on benefits and more on healthier indulgence as they day progresses.Energy boosts or increased protein are wanted in the morning, convenience and portability midday, and more comforting in the evening. Creating Flavor Variety: Flavor preferences differ across age groups and experience range, so having personalized options for audiences is ideal. Since high-quality S. dairy proteins have a mild flavor, they are a great platform for flavor experimentation. Adding Premium Claims: Consumers make their snack decisions based on packaging claims and they no longer settle for standard ingredients. Claims, such as premium ingredients, no additives, no added sugar and fewer preservatives are product differentiators. With each of these ideas for improved snacks, U.S. dairy proteins can add the highest quality available to meet your formulation check list. Visit ThinkUSAdairy.org for details U.S. milk and whey dairy ingredients and how they can enhance your snack items. 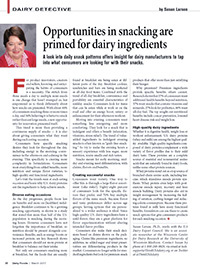 Download the Dairy Detective column, published in the March issue of Dairy Foods magazine, on opportunities in snacking are primed for dairy ingredients.